JUNE 2007 -- The Membership/Pink Sash meeting on April 29 was a resounding success. Ask any of the eighty persons in attendance and you will hear raves about it. I want to thank the National Leadership/Membership director Ed Luttrell for the outstanding presentation he did. I haven’t seen such an active response from a group of Grangers in a long time. I hope that those in attendance take back to their Granges the lessons and ideas they learned and put them to use. I will wait for comments and reports on their progress. 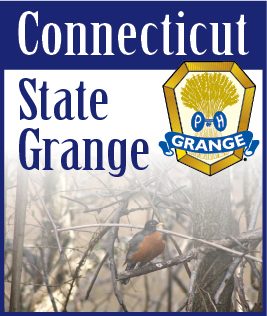 All of the State Grange Committees reported that day on the projects they are working on and some that are completed. You may have read of some of them in last month’s paper. One of the reports I should mention is from the Board of Directors. They have appointed Brother Bob Brockett as State Chaplain until a special election is held at the next Annual State Session. Brother Brocket is a past State Chaplain and he should move into this position with ease. Sister Jennifer Hawkins was appointed Chairperson of the Auditing Committee. She is a member Ekonk Community Grange #89. Sister Hawkins has a financial background and will serve the State Grange well. Inspection reports are slowly coming in. I realize that many Granges are being inspected in May. It’s a real busy time for the Deputies. The reports that have come in are encouraging but they are too few to draw any conclusions just yet. I will be better able to give you my assessment of the condition of the Granges in next months paper. There are a great number of activities going on in June. Many of them are mentioned in this month’s paper. I would encourage you to participate in as many as you can. All of them are geared to improving the Grange. I would also encourage everyone, particularly State Officers and Pink Sash members, to support the Community Granges in your area. Visiting Granges is a fun experience and an enjoyable one. Try it you’ll like it. I know I have and it’s becoming habit forming. Lastly, let’s put into practice the lessons that were learned on April 29 and see how much more we can improve our Order.